From weight gain to carpal tunnel syndrome, working a desk job takes its toll. According to the Mayo Clinic, sitting all day can cause high blood pressure, abnormal cholesterol, and even increase your risk of developing cancer. But by being proactive and taking some precautions, you can minimize the impact of sitting all day and keep yourself healthy and happy. Many people are so busy at work that they forget to eat, or drink water, and all those cups of coffee can dehydrate you. As your body craves water, you can feel hungry, irritable, or listless, just because you're thirsty. Keep dehydration at bay by keeping a large water bottle at your desk. If you need a boost of flavor, add some fresh fruit to it to give it some extra zing. Having it within reach will encourage you to drink throughout the day and stay hydrated. You might be amazed by how much more alert you feel with enough water in your system. Sitting at your desk not only contributes to obesity, but also to hypertension and other health issues. Get up and walk several times throughout the day to keep your muscles moving. If possible, step out at lunch for a brisk 20-minute walk. Better yet, schedule walking meetings to catch up on status reports and new updates. You'll find yourself more energized after your meeting than if you sat in a conference room. With so much going on at work, you may skip lunch or forget about it until you're ravenous at 3:00 p.m. That makes it even more tempting to grab a candy bar from the vending machine. Instead, make eating a healthful lunch a priority. A salad made with vegetables and chicken can give you energy, while a sandwich made with lean meats, tomatoes and kale can make you feel full for the rest of the afternoon. Whether you look down at the computer, or hold the phone against your shoulder to keep your hands free, your job can be hard on your neck. And all of that strain can cause your muscles to tense and tighten up, causing pain later on. Raise your computer to a comfortable height so you can see it looking straight ahead. You don't need expensive equipment; a few reams of copy paper can do the job. And a simple phone headset can allow you to use the phone while typing, without hurting your neck. All of that time in front of the computer screen can hurt your eyes, causing headaches, sensitivity to light, and dry eyes. Keep your computer screen about an arm's length away from you. If you can't clearly see the text on the screen, just increase your font size. There are also screen covers you can use to minimize the glare from the monitor to decrease the strain on your eyes. Fluorescent lights can be brutal on your eyes. If possible, ask maintenance to disable the lights in your office or directly over your cubicle, and bring in a floor or desk lamp of your own with softer light. If that's not possible, a small desk shade can help shield you from the fluorescent light's rays. When you're on a tight deadline and typing away, it's all too easy to end up hunched over your computer. But that position can be harmful to your back and joints. At the end of the work day, you can end up feeling sore and stiff due to your work habits. Invest in a good office chair or cushion to help encourage good posture. Apps like PostureMinder send you reminders throughout the day to sit up straight, helping you break a bad habit. Most importantly, if you have vacation days, use them! Vacations are physically and mentally important for you to unwind, de-stress, and spend time with loved ones. While office jobs can be hard on your body, you can counteract the effects with some ingenuity and preplanning. By preparing healthy meals and snacks and by reminding yourself to get moving, you can keep yourself energized all day long. 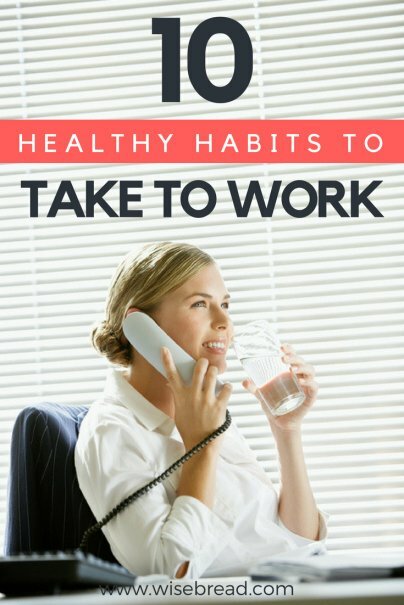 What other healthy habits can you do at your desk? Share with us! What is a desk shade and where are they sold?